I know what you’re thinking, fruit scented? Yes, these pens do have a smell to them, but surprisingly, the smell isn’t strong at all. I actually couldn’t smell it until I held the pen up to my nose. My previous experience with scented pens is very negative. I have a sensitive nose and I just feel like I don’t need my pens to be scented. 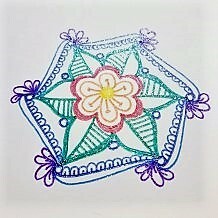 With all that being said, Let me introduce you to Fruit Scented Glitter Gel Pens that I purchased from Hollar.com for $3. 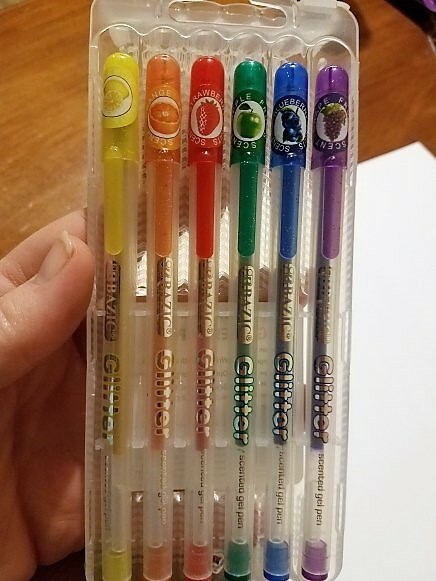 That means that each of these pens were $0.50. Now they only came in a six-pack, but honestly, you wouldn’t want too many smells happening in the same package. They came in a very nice plastic case that is comparable to Staedtler’s cases. This is nice because I think I would want to keep these seperate from my other gel pens. So now lets get down to business. How well do these pens write. First off, I was so surprised at just how vivid the colors are and how smoothly these pens wrote. They really don’t smear either like typical gel pens, but there is some smudging possible so be careful when you are using these pens to draw something of any significant size. Check out how each color just pops off the page. Each color was true to what you would expect, which I find can be a rare thing. 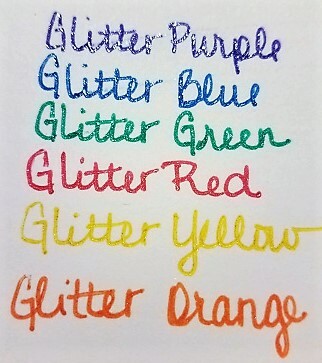 With my other gel pens, I’ve learned not to trust the caps on them, and I always test them on another page. However, these colors were exactly what you would expect and that is something I am grateful for. I know I always mention the color yellow, but I feel like reviewing the yellow colors can really make or break a gel pen set. Some yellows are too bright or too dull and you won’t get the effect you are looking for. But this one is just great. So I decided, as I usually do, to draw something for you, using just these glitter pens. The only thing I noticed is that I had great results with thicker lines. The thin lines just didn’t do it justice, but the glitter really pops with the better lines. I tried to show you the drawing at an angle so that you ca see just how the light catches it. 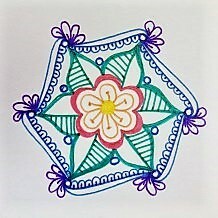 Let me know what you think below and what your experience with scented gel pens were!